Over the past six years, we have seen many “proud” moments at TMS–a Toddler recognizing their name card without their picture, a child completing their first map, or perhaps some of the proudest, when a Primary child receives their first reading book to take home. This BIG work happens sometimes over the course of several years. Here at TMS, we start letter sounds in our Toddler class (a,b,c,s,t) and it only builds from there in Primary. 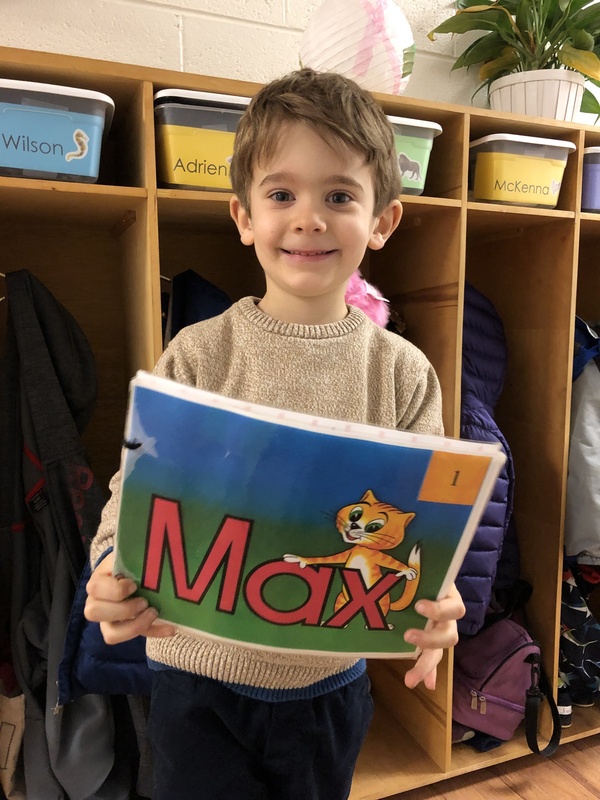 This is a multiple step process and it is no wonder that the child becomes elated when they receive their first book to take home to practice with their family. We begin by associating letter sounds, not names. For example, in Toddler, we introduce the base sounds by how we would read them on a page or sound out a word. For example, we introduce “aaah” and “buh.” The point in this is to allow to child to begin to blend letter sounds to form a word because that is how we read and write. We teach writing letters using lower-case first. 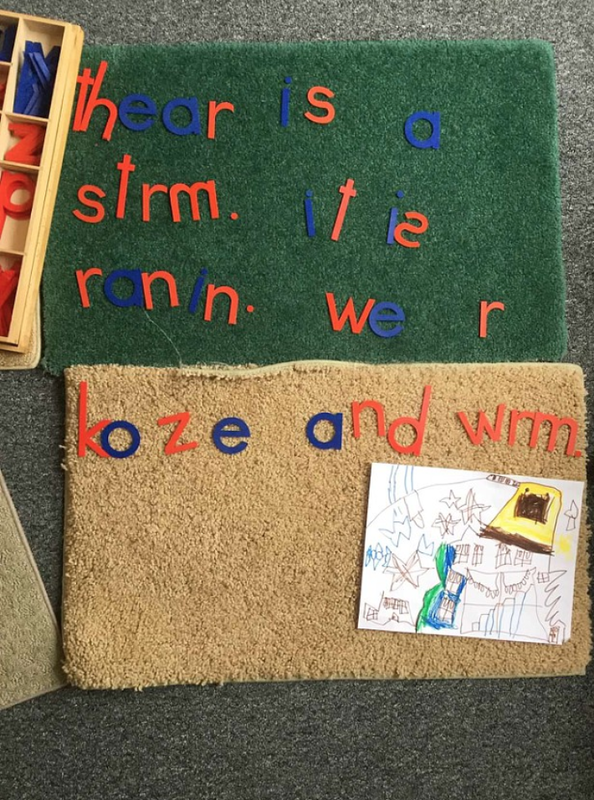 Using the Sandpaper Letters, the child is able to start associating a word sound with how it is written. And since we primarily write in lowercase, we introduce lowercase letters before capital. The child is now engaging the hand and the mind at the same time. We practice word-building and handwriting separately. Handwriting involves motor skills–it is the reason why you see your child spooning and holding small objects with a pencil grasp from the Practical Life shelves. We are building that hand muscle and slowly preparing them to write without them knowing it! Word-building involves a separate skill and that skill requires the child to use their cognitive skills to build a word based on sounds. Before we begin practice in handwriting, we start them on building words using the Moveable Alphabet. 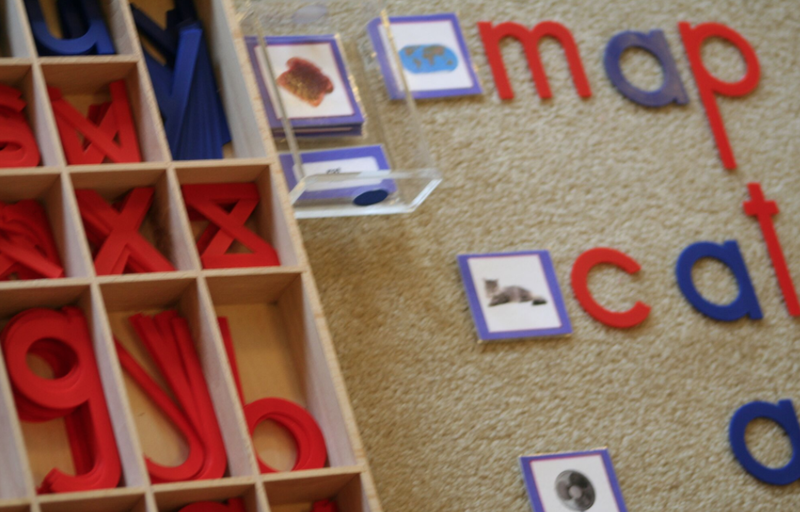 The Moveable Alphabet allows the child to phonetically spell out objects. Don’t be alarmed if you see misspellings! This is part of the process and part of the child’s inner self correcting skills. Over time and beginning to read, they will begin to self-correct these spellings. From there, we start to combine all of these efforts that we have been working on throughout the Primary years. After having plenty of work fine tuning their motor skills in Practical Life and working with the Sandpaper Letters and Moveable Alphabet, they can focus on handwriting. They draw a picture and use the Moveable Alphabet to create a story based on the picture and then use their newly acquired handwriting skills to write the story below the picture. And then, when the teacher can see they are ready, they spend special one-on-one moments with the Lead reading their first book at school. To the parents who have shared in this joy of your child bringing home their first book, you know what it feels like and the proudness your child feels! To those not yet to experience this feeling—get ready, because there is nothing like it!